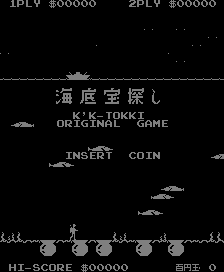 Kaitei Takara Sagashi (海底宝探し) is an arcade game that was originally developed by K. K. Tokki as a prototype and later sold to Namco in early 1980, where it was completely rewritten and became the second of three monochromatic titles released by that company for arcades during the early part of that year; the first was Navalone and the third was SOS. It was also the only Japan-exclusive one. Use the 2-way joystick to direct the boat across the surface of the ocean, then press the Firing Button to lower the diver down to the bottom of the ocean while watching out for the sharks swimming across the screen; during this time, you can hold that Firing Button to pause the diver's descent and push the joystick in either direction to fire a harpoon at the sharks for 30-300 points apiece. Once the diver has reached the bottom of the ocean, push the joystick in either direction to make him walk towards either of the two treasure caches that are closest to him (the boat will automatically follow his movements at this point); when the diver is directly over a treasure cache, the boat will lower him into it. The amount of points you will receive when you make it back onto the surface of the ocean, which can range from 50-250, will then appear on the screen - and the boat will raise the diver back up to the surface of the ocean. Once again, you can hold that Firing Button to pause the diver's ascent, and push the joystick in either direction to fire a harpoon at the sharks; once you have made it back up to the surface of the ocean, you'll have to repeat the entire process for each of the four remaining treasure caches, before the game proceeds to the next round. The differences between the two versions are explained below. The K. K. Tokki version of the game starts up immediately when the power is turned on, while the Namco version does a "RAM test" that is typical of their 8-bit arcade games (with, at the time, the two notable exceptions of their very first arcade title Gee Bee and the aforementioned Navalone). The K. K. Tokki version of the game features the message "INSERT COIN" on its title screen and the Kanji text Hyakuendama (百円玉), which means "100-yen coins", in the bottom-right while the Namco version features the message "DEPOSIT COIN" and that English text "CREDIT"; it also says "PUSH START BUTTON" when a coin is put in. The K. K. Tokki version of the game measures the player's score in American "dollars" and rolls over at 99990, while the Namco version measures it in more conventional "points" and rolls over at 999990; therefore, the only way to get a six-figure score in this game is by playing the Namco version. This page was last edited on 10 September 2013, at 16:30.